The Seay Team is mother/son team who have a diverse background that can cover a lot of ground to assist you in your Real Estate needs. 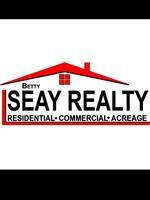 Betty Seay, and I am the Broker for Betty Seay Realty! It has been a long road for me throughout the years. I started my first career was as a social studies teacher in Kentucky. I was a Social Studies Consultant for the Kentucky Department of Education. I have traveled extensively and was awarded grants to study in Japan, Ecuador and Mexico. I retired from teaching in 1998 and have been in real esate in Kentucky since 1999 and a Principal Broker since 2004. I own my own real esate company and work with both foreign and national clients. I do strongly believe in educational programs to enhance the Realtors ability to work professionally. I have received designations recognized by the National Association of REALTORS® as a Certified Residential Specialist, the Graduate Realtor Institute and as a Certified International Property Specialist. Edward Seay, Even though my background is not in Real Estate, I do have knowledge in the housing industry. In 2003 I graduated from Lexington Community College with an Associates in Architecture Technology. Upon Graduating, I then attended the Savannah College of Art and Design where I went to recieve a Bachelors in Industrial Design and a Minor in Architecture.